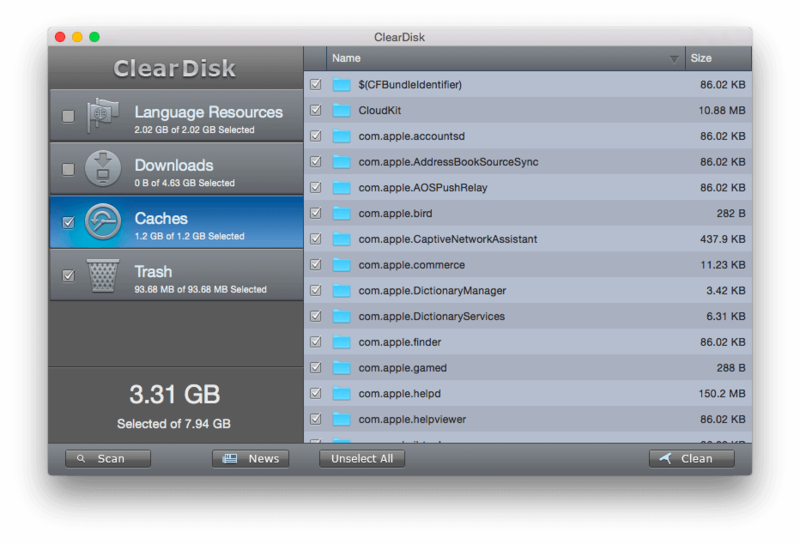 ClearDisk is a cleanup utility that helps you get rid of gigabytes of unneeded files on your Mac. Language resources, Downloads, Caches and Trash just waste your disk space. It is recommended that you clean your Mac regularly. With the help of Clear Disk, you can free up as much space as you have in your Trash folder, Downloads folder, more than 500 MB of Language Resources and several gigabytes of Cache files. Open ClearDisk, select all types of junk files you want to scan in the left section and click the Scan button. 2. Then click the Clean button to get rid of the junk on your Mac.